The cuisine of Quintana Roo is at the level of the best in the world, the presence in the state of outstanding chefs and sommeliers have allowed events such as the Wine & Food Festival, which celebrates its tenth edition this year, give a greater projection to the different destinations in the state. “For this edition of the Wine & Food Festival, runs from October 31 to November 11, and seven events have been scheduled that will involve the participation of 15 star chefs from Mexico and the rest of the world”, said event director David Amar, who stressed that for this occasion events will be held in Playa del Carmen, Tulum, Isla Mujeres and Cancun. He stressed that, during the previous festival editions, in addition to showing the best of gastronomy, more than 250 culinary events have been offered, receiving more than 350 chefs from around the world, generating more than one million impacts on electronic media and counting with the participation of more than 25,000 people that have attended the events (33% of them were international tourists). On this occasion, the festival will transform into a great gourmet platform for dinners of all nationalities, with the collaboration of some of the best chefs in the world. In addition, a new Gastronomic Guide will be introduced this year, in which David Amar, places his 50 favorite restaurants in Quintana Roo, which according to heim, are among the best in the world. The festival began on October 31st with a rooftop party at the Thompson Hotel, Playa del Carmen; On November 1, the Exquisite Cruise & Couisine was held, lunch and ride on a yacht, the hotel for that night was Zoetry Villa Rolandi Isla Mujeres. On the same day the Montreal Gastronomy Experience was held at The Five Dos Town Hotel and Residences, in Playa del Carmen. On November 2, The Best of the Best Dinner: Stars of Quintana Roo event took place. On November the 3rd the Tulum Sinful Feast, party and dinner took place at the Beach Hotel & Restaurant Zebra Tulum. 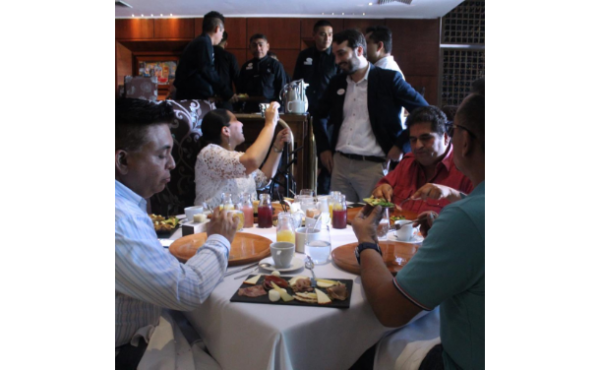 On Novmber 4, a series of tastings were held with the participation of the Star Chefs of Mexico. On November 10th and 11th, the Wines of the World Tasting Market event and tastings will be held at the Moon Palace Cancun.